Bake sweet potatoes for 1 to 1½ hours, (until tender) Remove potatoes from oven and cool. When sweet potatoes are cool enough to handle, slip off the skins. While potatoes are cooking, rinse the cornhusks under cold water and place in a large bowl making sure they are covered with water. Place a couple of plates on top of the husks to keep them submerged. Let husks sit in water for 1 hour or until soft. Place butter in a large, heavy bowl and beat for 2 minutes at medium-high speed. Add, sugar and mix for 2 minutes at medium-low speed until the mixture is very creamy and light yellow. Add the roasted sweet potato and mix it until fully incorporated and the mixture is fluffy. Add corn flour, rice flour, baking powder and salt and mix at low speed. While the mixture is running, slowly add milk. Blend until ingredients are fully incorporated. Drain the cornhusks and give the husk an extra shaking to dispel any excess water. Lay one husk flat in your hand or on a work surface. Scoop about a 1/4 cup of the masa mixture into the center of the husk. If the husks are too small or broken, put 2 husks together, overlapping them. Using the back of a spoon, spread the masa on the husk in a thin layer to the top part of the husk and down. Place 3 pecans, 3 raisins and 1½ tablespoons diced pineapple in the center of the masa. Fold in the sides of the husk so that dough covers the filling. Fold up the narrow bottom of the toward the back. Set the prepared tamales on a tray and cover with a damp cloth while you assemble the rest. Cover the bottom of the steamer basket with some of the leftover cornhusks. Arrange the tamales vertically, standing them on their bottom fold and letting them rest against one another. Cover the tamales with more leftover husks or a kitchen towel. Cover the pot with lid and cook over medium heat until the tamales slide out of the wrappers, about 1 to 1½ hours. Try never to let water in the steamer go off the boil once you have started cooking. 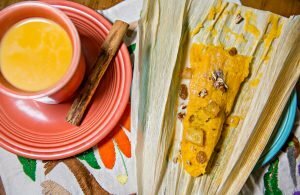 Serve tamales warm with a tablespoon or more of sweetened condensed milk.